Admirable Women – Olympiad Jennie Finch Rejects “Infamous” Fame, for Family | It's the Women, Not the Men! 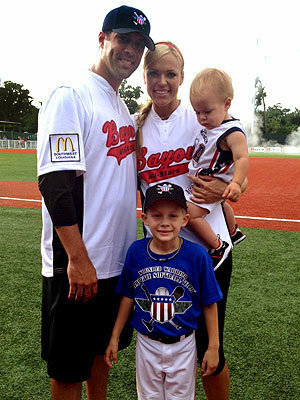 Jennie Finch, 33 – Christian, Married Mother of Three and Two-Time Olympic Women’s Softball Champ. Unless you are a devotee of women’s softball games you may have never heard of Jennie Finch. And, that’s unfortunate because not only is she an extraordinary softball pitcher, helping Team USA win at two Summer Olympic games medals but she is a devout Christian as well. Jennie is the daughter of Doug and Bev Finch. She was born and raised in California and is the youngest of three children. Her two older siblings are boys, Shane and Landon. When Jennie was just five-years-old she showed a talent for softball and so her father became her first coach. By the time she reached the age of eight, she was pitching. This God-given talent would prove to being her world-wide fame and recognition. In high school she lettered four times in softball. She was an exceedingly talented athlete lettering in volleyball and basketball as well. As a senior in high school she was the captain of all three sports. While at the University of Arizona she began her string of no-hitters for the Wildcats for which she was named First Team for the NCAA. As a junior, in 2001, Jennie set a NCAA record with a perfect season, finally winning the National Championship. Her college career records for consecutive no-hitters, home runs and strikeouts are too numerous to list. Her number 27 jersey (the date of her parent’s first date) was retired by U. of A in 2003. Now Jennie Finch’s Olympic softball career would begin. She led her team to a gold metal victory in the 2004 Summer Olympics and after losing to 3-1 to Japan, came home with a silver medal in the 2008 Olympics. By now , Jennie was world-famous and, in case you didn’t notice, not only is she an amazing softball player but her is beautiful too. In 2005, Jennie married Major League baseball pitcher Casey Daigle. The couple have three children, two boys, Ace born in 2006 and Diesel born in 2011 and a little girl, Paisley, born in 2013. Mrs. Daigle retired from all of her softball activities in 2010 because she said she was spending too much time away from her husband and little boy. She is continuing to follow her faith and leads a truly Christian life we can all admire. Jennie Finch Daigle has succeeded in becoming a positive role model, not only for young women, but for the world.